At Fenton Avenue Charter School in Lake View Terrace, teachers rarely complain of sore throats, laryngitis or other maladies that come from talking for several hours a day. That’s because each of them uses a microphone, a tool they say eases the strain on their voices while allowing children to hear their every word. “I don’t have to yell,” said first-grade teacher Donald Ausherman, who wears a microphone headset, similar in style to those worn by pop stars Janet Jackson and Madonna. “The mike evenly distributes my voice,” he said. At Fenton, all 46 classrooms are equipped with the wireless system, which features a microphone headset, wireless FM transmitter, receiver and 20-watt amplifier. At Normandie Avenue School in Los Angeles, about 20 teachers routinely use mikes in their classrooms. Principal Russell Matthews said he plans to survey the school’s teachers to determine if others want the devices. “If they like it and they use it and it seems to be beneficial, then we’ll see about getting more,” Matthews said. Spokesmen for the Los Angeles, Burbank and Glendale unified school districts said they were unaware of other schools that routinely use classroom mikes. Advocates of the microphones say children are better behaved and pay closer attention when they can clearly hear the teacher. 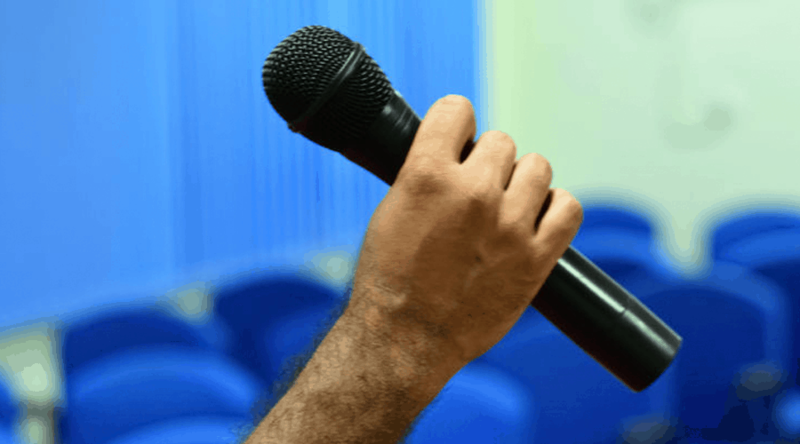 Despite the benefits, some question the use of microphones in the classroom. When Fenton began installing the system four years ago, it cost $500 per classroom – an expense the school paid out of its existing budget. It now costs $600 per classroom to install the equipment. Ruth Harris, clinic coordinator of the Language, Speech and Hearing Center at California State University, Northridge, said vocal strain is a common problem among teachers and merits attention. “There are lots of teachers who have not developed problems with their voices, but for some it’s a real problem, and some have dropped out of the teaching field because of it,” she said. Vocal strain is a condition that can lead to the formation of callouses and even ulcers on the vocal folds in the larynx, Harris said. “If you are speaking high for prolonged periods of time with a lot of volume, you are introducing strain on the muscles of the vocal cords,” Harris said. She said women especially are prone to vocal strain because their voices are high pitched and don’t carry as far as men’s voices. Fenton began using the microphones after campus administrators saw teachers using the devices at a San Diego-area charter school. Fenton slowly introduced the microphones, giving them first to teachers who were prone to laryngitis or who had soft voices. “We started with two teachers. Then it kind of snowballed. Before long everybody had them,” Lucente said. Ann Mendoza was one of the first teachers at Fenton to use a microphone. Initially reluctant to use a mike, the third-grade teacher never addresses the class without one now. “Before I started using the microphone, I would get laryngitis or I would lose my voice,” said Mendoza whose soft voice barely carries past the first row of desks without the mike. “Now I can’t imagine not using it,” she said. Students said they can hear the difference. “With the microphone, you can hear better. Without it, it’s like a whisper,” said Julian Ramos, 8, a Fenton Avenue third-grader. Parent Gabriela Palma said the microphones allow teachers to grab students’ attention more quickly. “It’s easy for them to get the attention of the children and get them to listen,” said Palma, whose two sons and niece attend Fenton Avenue. For Ausherman, the first-grade teacher, the benefits of using a microphone are clear. Why Is Sound Amplification So Important? Want more information on classroom audio systems? Sign up here. Interested in a free product demo or need a quote? Click here to visit our contact page.